Somebody get me a longer camera lens! I could sit around and whine about what’s fair, but instead, I decided to experiment!! 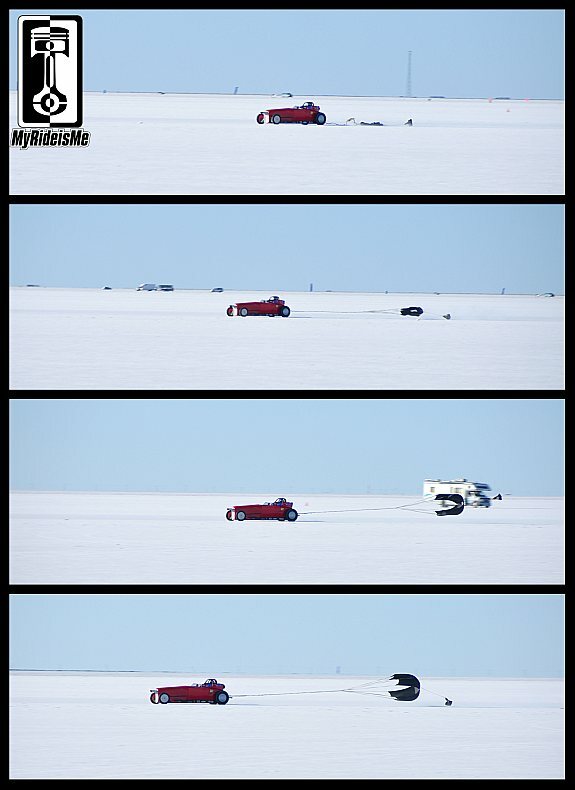 I’ve been going to Bonneville since 2009, so I’ve seen alot of the great white expanse. I haven’t, however, spent too much time near the end of the track. The Bonneville race cars speed by at 200 to sometimes 400 mph, so you don’t have much chance for photos! I tried my Nikon 18-200 anyway and here’s what happened… Chute pops! This #507 owned by Dan Aleshire running in the B/GR (roadster) class. 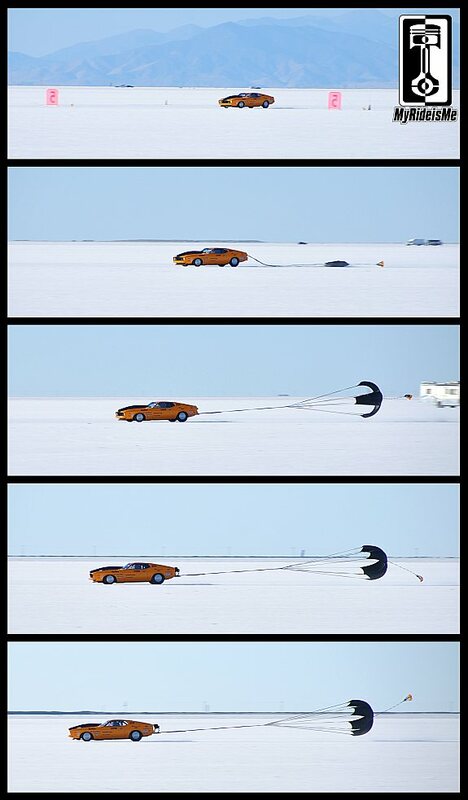 Both cars in these pictures were travelling over 200 mph! When their parachutes open, especially when they’re still coming towards you, there’s a fascinating delay between when you see the chute open and when you hear it… like counting how far away lighting is… one thousand-one, one thousand-two… then you “POP!” It’s awesome! Then here one of the fastest Mustang’s you’ll ever see! I’d love to hear from some pro-photog’s to see what I did right and how you do it… with a big-time lens and a faster body, what kind of shots do you get? After my first trip to the salt last year, I was truly amazed ! Driving past the pit area and then a little farther, I looked down and realized we had driven 9 miles from when we first entered the salt ! The cars, the people, the sounds are just awesome. All your pictures bring back great memories. Excellent pictures and the ones you took with the cars at 200 + mph are great, especially with a “small” lens . Thanks again and keep those great photos coming !